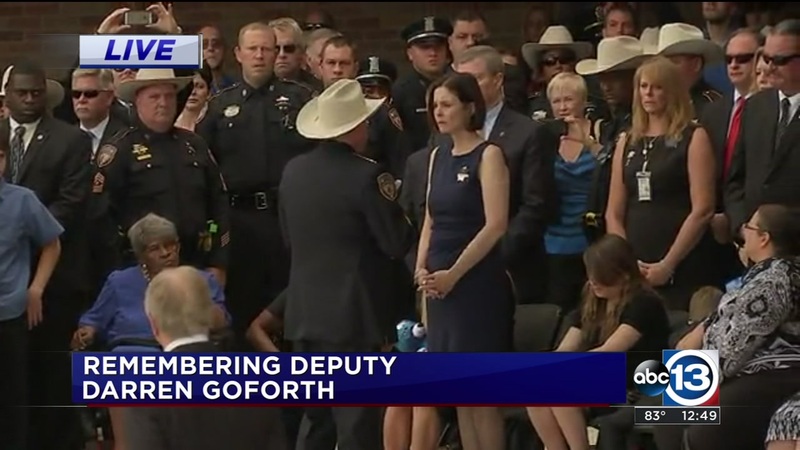 Tears and pride, sorrow and sobs emanated from the throngs gathered to mourn the death of Harris County Sheriffs Deputy Darren Goforth. 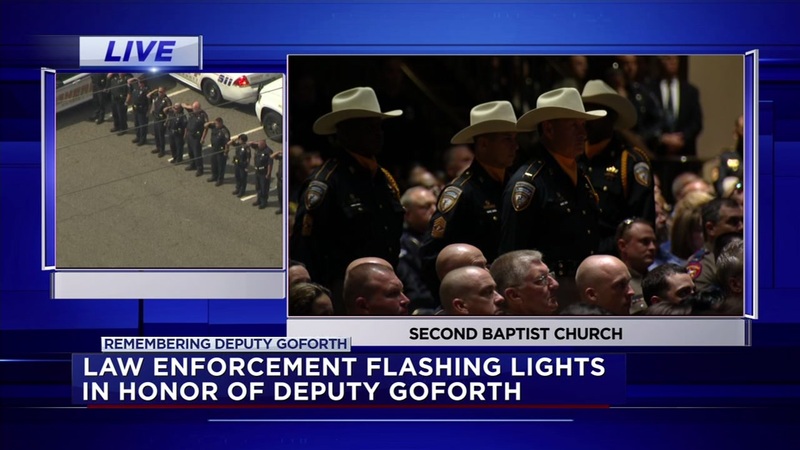 HOUSTON (KTRK) -- Family, friends, fellow officers and those who wish to honor Harris County Deputy Darren Goforth said a final farewell to the fallen deputy today at the Second Baptist Church in Houston. 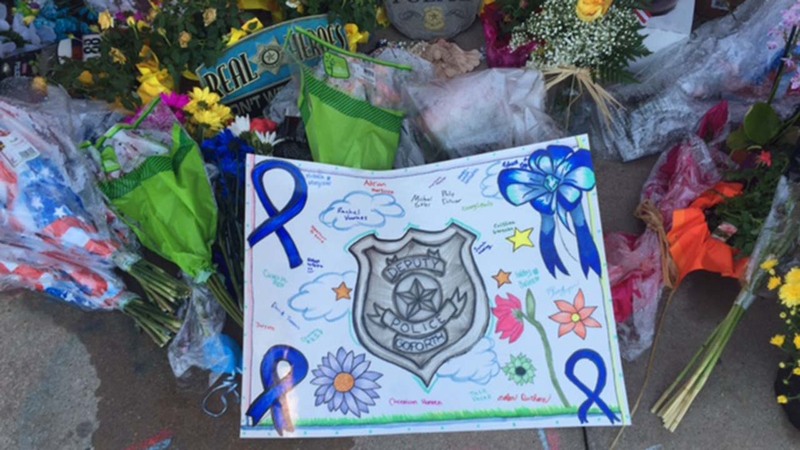 Goforth was gunned down last Friday night while putting gas into his patrol car. His funeral at Second Baptist Church began at 10am with a public viewing, with the service beginning at 11am. The church has seating for more than 5,500 people, and it appeared every seat was filled. Officers arrived from across the state and country to show support for his grieving family and our community. The folded flag was presented to the wife of fallen Harris County Deputy Darren Goforth during his funeral on Friday. "It's hard to explain unless you are one. It's just a strong tie. People will come from all over the country for this," says Officer Kaleb Edwards from the Sherman Police Department. 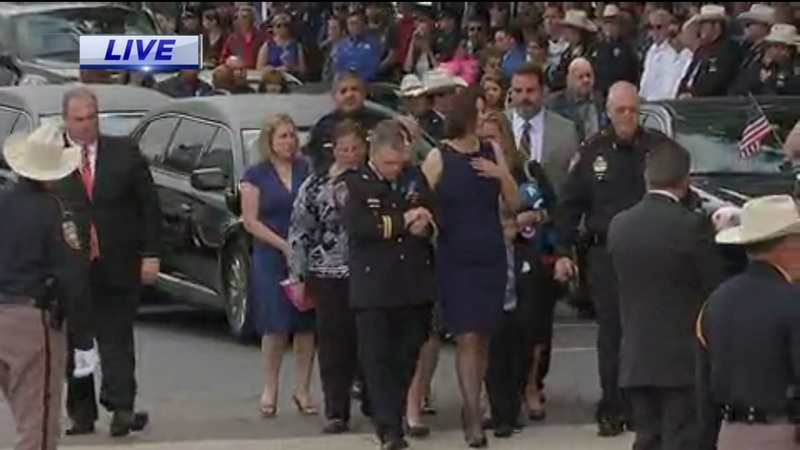 In a particularly poignant moment, Kathleen Goforth, the widow of Harris County Sheriff Deputy Darren Goforth, saluted law enforcement gathered outside Second Baptist Church in Houston ahead of her husband's funeral. His colleague Officer Eric Withrow said, "This one is a little different because it was an attack, it was a planned, he intentionally took his life. It wasn't resisting arrest. He found him and killed him." 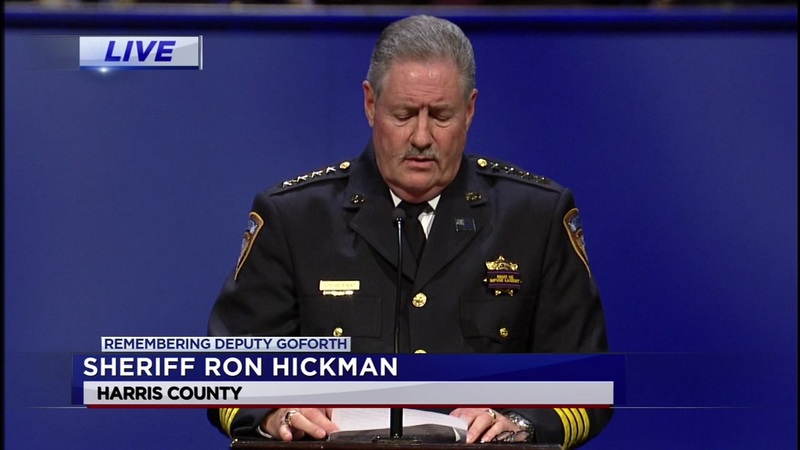 Sheriff Ron HIckman spoke to the thousands of people at Second Baptist. Across the street from Second Baptist Church, residents at Woodway Square Apartments are showing their support by making small ribbons for people to wear and placing larger blue ribbons on trees leading up to the church. "I think a lot of people want to help and participate. It's a really sad time right now, especially for the family and their loss," says resident Alice Cazares. Resident Susan Starnes added, "We have the opportunity to tell people who are visiting from all over the nation to support our law enforcement. We believe in them and stand with them in a way that we don't get to say that enough." 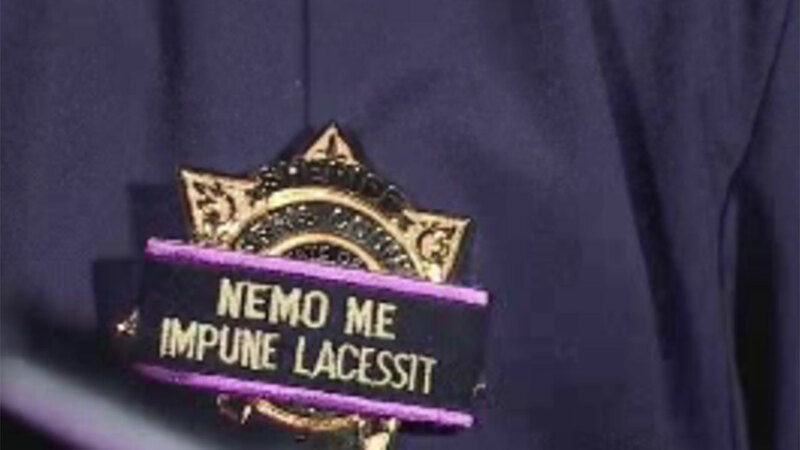 Eyewitness News also spoke with the honor guard that will be part of the ceremony. HCSO Honor Guard Commander Lt. Reuben Diaz said Thursday, "It breaks our heart that we're having to bury another one of our own. We have honor guards coming from all over the country in support of this. It doesn't matter what color uniform is, we are all blue brothers. We all support each other. We are here for the same common goal, to serve and protect. And we're all going to support each other when someone brings us harm." HCSO Sgt. C. Collier added, "What's going to happen tomorrow is the highest honor that can be given to an officer who falls in the line of duty." A steady stream of law enforcement arrived at the church today. On Friday, the church will be a scene of honor, pride, and grief for all men and women who wear the badge, the community that supports them, and the Goforth family. Diaz said a 21-gun salute, TAPS, bagpipes, a riderless horse and a helicopter flyover are some of the features of the tributes to the deputy. 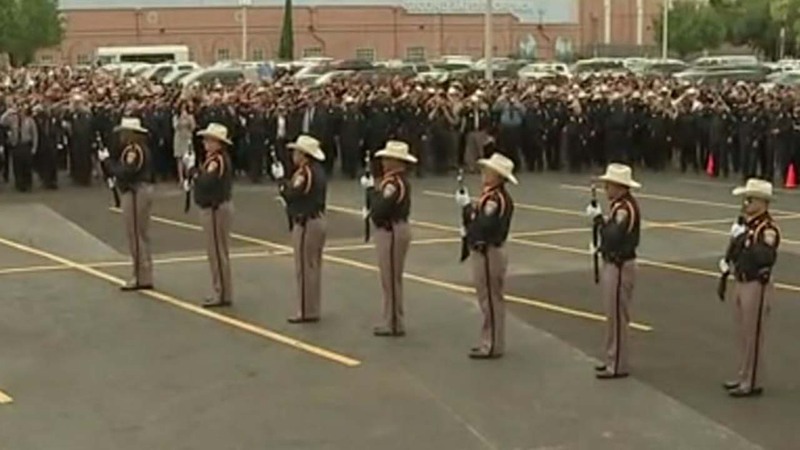 "Taps" and 21-gun salute sounded at the funeral of Harris County Deputy Darren Goforth in Houston. Here is a photo that was released by the family of Harris County Deputy Darren Goforth. And as the honor guard prepares to remember one of their brothers, Collier shared a reminder and an important message to the public: "Don't lose faith in U.S. Constitution, the Penal Code, and your local law-enforcement. Don't lose faith," Collier said. "Officers are good. We're going to do a good job." Click or tap here if you'd like to donate to the 100 Club, which funds the family of fallen police officers and firefighters. and you can donate to the family at this GoFundMe link.